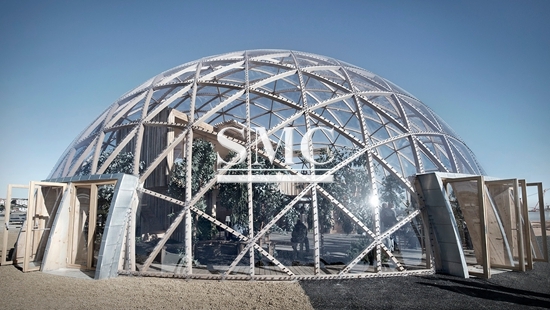 Home>News of Construction and Building > Geodesic Domes: the Future of Constructions? Geodesic Domes were developed in the 20th century by the engineer and architect R. Buckminster Fuller. They are spherical buildings made up of arrangements of polygons -known as geodesics- linked together by rods to form triangles. The triangles’ surfaces linked together form the spherical or half-spherical shape. Struts and panels are largely in tension and distribute the stress within the structure itself, thus avoiding the need for extra supporting elements. The triangle has been chosen for its maximum strengths among all shapes. Fuller revolutionised the traditional architecture by taking advantage of tension instead of compression and replacing the arch principle. Bars or rods forming the skeleton of a dome are usually made of wood or metallic alloys. Steel is actually the most used material at the moment because household’s concerns for the environment leads them to minimise wood consumption. The triangular surfaces among the rods can then be covered with basically any material: concrete, plywood, Plexiglas and others. Concrete is usually chosen for underground geodesic domes. On equal terms of floor space, geodesic domes occupy 30% less surface area than a traditional house. That is thanks so the basic idea – reintroduced by Fuller- that when the sphere's diameter is doubled, its area is quadrupled and its volume increases eightfold. The decreased surface area means that less building material is required to build a geodesic house. Yet, it will be about five times stronger than a normal house! The spherical shape is more efficient at keeping heat inside and it allows air to circulate smoothly within the structure. This suggests a 30% savings on the heating and cooling bill for a dome owner. Surely, the aesthetic of such houses is very anti-conventional. Yet, spherical shapes better adapt to the environment while still guaranteeing remarkable strength. Thanks to the large surfaces they allow, they have been used for public buildings so far -such as stadiums, theatres, sport centres, etc. Traditional practices and perceptions can limit changes and improvements in construction practices. Yet, there are problems in conventional construction techniques, which can be with alternative techniques. So far, geodesic domes are just at the very beginning and whether they will significantly be used in the future can only be said with time. At Shanghai Metal Corporation, innovation is one of our five core values. Thanks to our expertise and research we can provide you with solid structures for Custom Building, Agriculture and Farming Building and Light Steel Structures. For more information and a full list of products, please click here.